Have you tried using translucent tracing paper with any of your projects? Great designers and artists have used different kinds of vellum for hundreds of years, and a modern vellum is an important tool on any contemporary designer's list. This versatile paper allows the user to explore different options for their work by building layers and fleshing out concepts. Originally, vellum was made using the skins of animals, and medieval manuscripts the world over were bound in it. 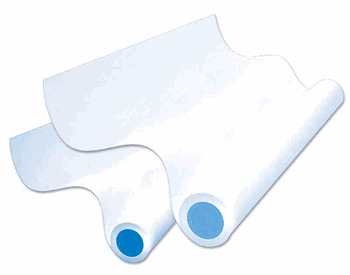 When compared to paper, vellum was durable, highly resistant to changes in humidity and temperature. It was used to stretch over frames for painting until canvas was developed. Some musical instruments even used vellum skins. A famous example of the use of vellum can be found in the original printed book, the Gutenberg Bible - 12 of the 48 copies of the book were on vellum, meaning the skins of at least 170 calves were used in their production. Nowadays, modern vellum is now synthetically produced and readily available for the average consumer in a range of weights and sizes. Some retain the austere thickness and softness of their namesake, while others are crisp and light for freer use. In many places, "vellum" now refers primarily to translucent tracing paper, which has a wide range of practical applications. Vellum is used widely in professional drafting for blocking out type or logos, expanding on concepts and making corrections or notes on technical drawings. Painters can use vellum to layer over their drawings and experiment, and fine arts educators can use sheets of it to make corrections on a work or demonstrate techniques without touching the original. Some varieties can even be used in print, which means book and print artists can now make use of its unique properties. When using vellum as a medium for your work, you are participating in a long tradition of creativity, as well as a widely-used standard for professional architects, draftsmen and designers. If you've never tried it, pick up a ream today and give yourself a chance to see how it can add to your process.